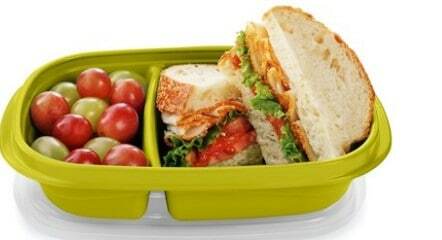 Walmart has Rubbermaid TakeAlongs Sandwich Food Storage Containers, 3 Pack for $2.46. Choose in-store pick up to save on shipping charges or you can get free shipping on orders over $35. Designed specifically for a sandwich and a side like fruit or hummus, the divided base tray in this food container is also great for salad fixings, cereals and fruit, or chips and dip. It helps with meal prep and keeps wet and dry foods separate and secure so you can take your favorite sandwich, lunch, or snack to work, school, or anywhere you want to go.